Nintendo’s ever-popular Pokémon series has more spin-off titles than you can shake a stick at. From puzzle titles to a game based around taking snapshots of the critters, Nintendo know the possibilities with the series are huge. Along with these games, once per home console generation, the series mascot “Pikachu” gets the chance to shine in a title of its own. This started with the N64 release “Hey! You! Pikachu!” that came with a microphone so you could talk with Pikachu, and “Pokémon Channel” where you watched TV shows with Pikachu. The Wii entry for this series is “PokéPark Wii: Pikachu’s Great Adventure”, this time instead of being a human protagonist befriending Pikachu, you ARE Pikachu. After being beckoned by the legendary Pokémon Mew, Pikachu and his pals are sucked into the PokéPark which is wholly populated by just Pokémon and set out into various zones. It’s clear from the outset that this title (like the other Pikachu-based titles) is aimed at slightly younger age group than the main series. It’s designed to be simple and fun without adding the complexity of the main games. The game is played with Wii remote on its side so it’s got more of a classic control scheme. 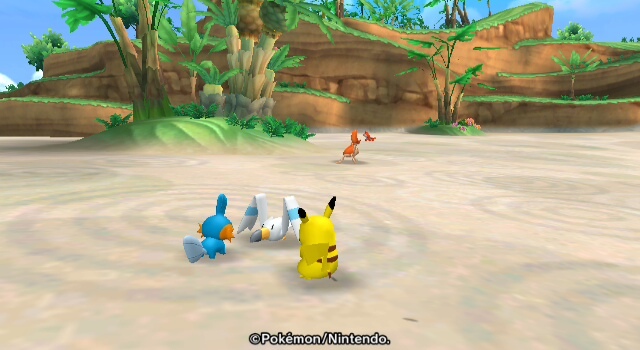 Pikachu moves using the D-pad and button 2 makes him jump while button 1 unleashes Pikachu’s trademark Thundershock attack. After a quick tutorial, the game quickly launches into the story about the PokéPark’s source of power, the “Sky Prism” shattering and having to collect the various pieces. This is done by beating the various challenges in each zone, and making friends with the Pokémon by beating them in skill games. These games come in 4 types; Chase, Battle, Hide & Seek, and Obstacle Hop. They pretty much are what they say on the tin (battle is about the closest the franchise comes to displaying real-time battles outside the anime) and take place in the large lands you explore. 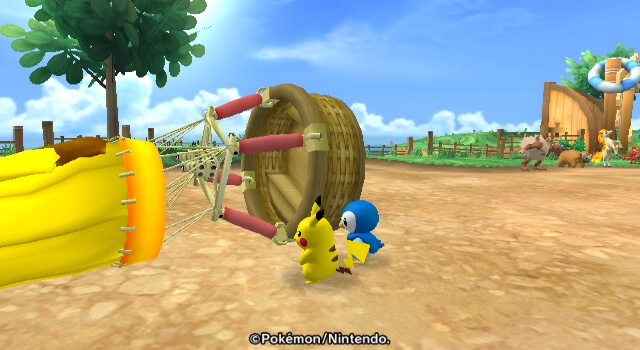 In addition to befriending Pokémon, there is a number of mini-game “Attractions” to play. You need to complete each one once in order to get a shard of the Sky Prism. They range from races where you shake the Wii remote vigorously to a breakout style game that only uses the d-pad. Most of these mini-games are pretty short and offer a nice diversion from hunting around for Pokémon. It’s an additional nice touch that each mini-game can be played with a fair number of extra Pokémon. The biggest downside is that there are no additional levels or courses for each of these challenges, so once you have completed them with all the Pokémon, there’s nothing else to them. In a few of the motion-control games (in particular Pelipper’s Circle Circuit), the responsiveness is a little stiff, but most of the games run just fine. 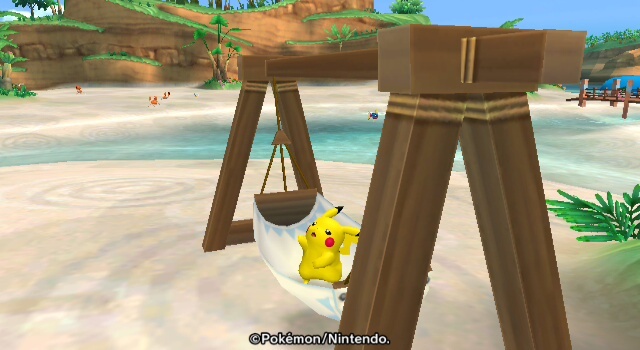 There are also little tasks for Pikachu to do in the Zones, and most of these are fine, though one or two require Pikachu to carry an object that slows him down. 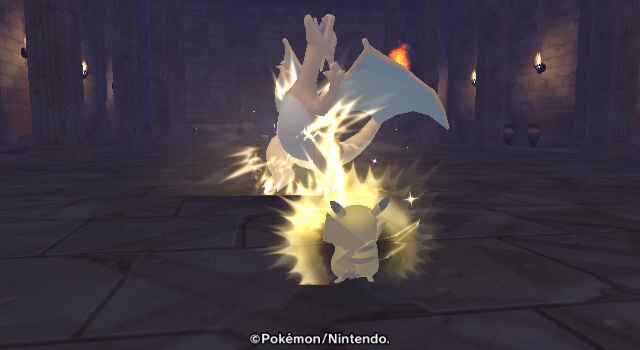 One instance requires walking past a Pokémon that attacks for no reason (the only ones in the whole game to do this, though larger Pokémon will attack Pikachu if he attacks them). The game frequently rewards players for exploration and taking on tasks. However, once you have befriended a Pokémon (and maybe challenged them again on slightly harder mode to become “best friends”) there is not much more can do with them other than replay the skill game. Thankfully there’s a lot of Pokémon to talk to, but once the story ends (which will take maybe 4 to 5 hours depending), you start running out of new things to do. The game does add additional Pokémon to unlock on certain mini-games once you get the time record bonus for each individual critter you befriend, but because they are short courses they only add about an hour or 2 to the game. On the plus side, an arcade mode is offered to try and best your time with each one. The lay of the land for most of the game is gorgeous. There’s plenty of landscape to take in and as you befriend Pokémon, it becomes more populated with active Pokémon playing together, and they all have wonderfully animated models. Certainly if you’re a fan of Pokémon and relish the idea of seeing the critters move in glorious CGI, this is the game for you. Most of the environments are inventive and fun. The last few Zones are a bit less inspiring in design, due to lots of grey stone walls and pillars, but it’s certainly admirable to see the effort that has gone into making this a believable world. The game also provides a photo mode that allows players to take pictures, which is great for relishing certain Pokémon appearances, or just for getting a funny shot of something. PokéPark Wii is short romp but an enjoyable one. If you’re a big Pokémon fan or even just enjoy the anime, you’ll get a kick out of this just for the sheer novelty of meeting your favourites, and playing as a Pikachu just as overpowered as the one in the anime. It won’t be everyone’s cup of tea, and experienced gamers won’t find much challenge here, but the game manages to do what it set out to do quite well, and if you’re looking for a fun bit of gaming fluff, you could do worse than PokéPark Wii. It is hard, however, to entirely recommend at the full retail price it goes for due to its short length. If you liked the other quirky Pokémon titles, like Pokémon Snap and Pokémon Rumble, you will love this game. Everyone else might want to give this a pass. Next Next post: Lady Geek TV #7 – Can an App Really Make You Fit?